Veggie Pot Pie, in an all-butter crust. So good! 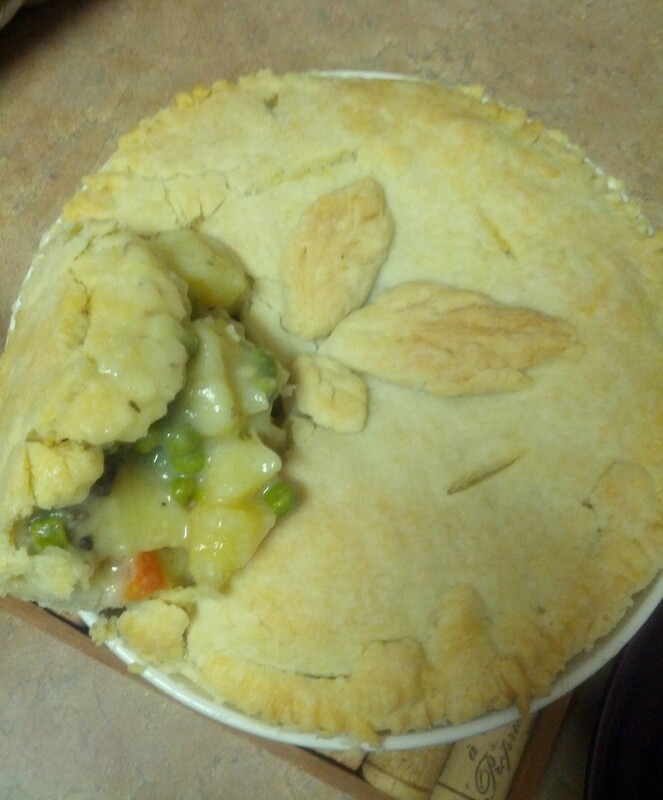 Veggie Pot Pie…homemade tastes nothing like the store-bought version. Leftover frozen veggies? A random potato or two lying around? A single serving of meat? Toss it all together in a pie crust and pop it in the oven. Yummers! Just typing this makes me want to eat some, and I just had dinner! Seriously though, it’s really good stuff. Healthy, hearty, filling, comfort food. I never really ate this growing up, but I want to integrate it into my own foodie repertoire, because it’s really delicious, and not that hard. When I made this dish last, I made double the filling, and then just stuck the remainder in the freezer until the next time I made veggie pot pie. The first time I made the dish, I didn’t have a pie plate, so I just used a regular ceramic bowl and then cooked it in a bain marie in the oven. Basically, I put the dish in another dish, and filled the larger dish with water, the same way you’d cook crème brule. The next time I made the dish, I took the frozen filling, and mixed it with some rehydrated TVP for a different (and more meat-like) variation. Both versions were delicious. If you make this recipe, let me know in the comments what filling you used — I’m always looking for inspiration! Next Post: Odd ingredients I have in my kitchen, and how to use them. Or wine jelly. Either or. This entry was posted in Memories of Meals Past on October 31, 2014 by Margaret. Writing this blog has taught me a lot about my cooking style, I’ve found. I tend to throw dishes together, using a recipe as a starting point and not an unimpeachable truth. I’ve also found that I substitute things like crazy…and that it usually works out deliciously anyway. And the latest thing that I’ve learned, is that I’m not the most patient cook. I like to cook and whiz around the kitchen and do the dishes while I’m waiting for the dish to finish cooking/baking/whatever-ing, and then I like to eat the dish. 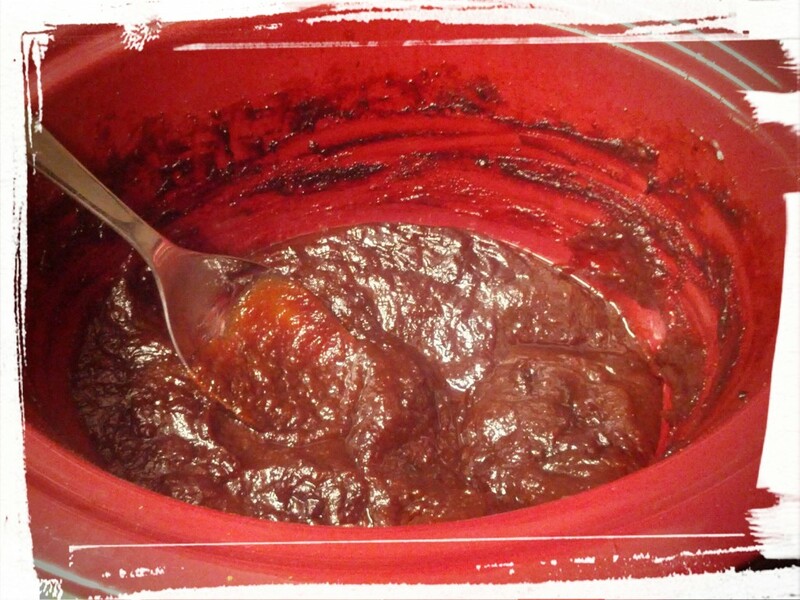 And then I made today’s blog post dish, Pioneer-Style Apple Butter in a slow cooker. And slow cookers? Are slow. But for a wedding gift, I was given a slow cooker so I’ve been reading slow cooker recipes for a number of months now, trying to figure out the best one to start with. And then I came across slow cooker apple butter recipes, and my life was complete! 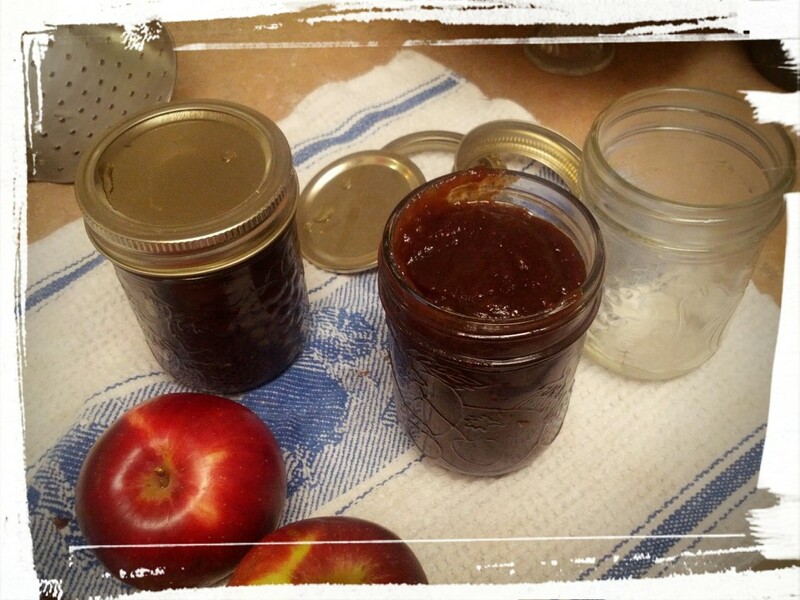 Because I LOVE apple butter! I remember eating it first as a child when I went to the Black Creek Pioneer Village, and spreading it on thick brown bread made with flour ground in the stone mill. I saw the apple butter bubbling on a cauldron over a wood fire and it tasted like outdoors and everything yummy and wholesome. This recipe tastes just as good, sans the wood ash. I originally made it with a half cup of honey as well, but I think it’s sweet enough without, and so who needs extra sugar? Or just remove the white sugar and keep the 1/2 c. of honey in. Up to you! Dump, sprinkle, cook, and walk away. Peel and quarter apples. Dump in slow cooker. Add in remaining ingredients on top. Put on lid. Cook on high for about 12 hours, stirring after the first two hours. Basically, you just need to keep an eye on it till it bubbles up (around the two hour mark), at which point you stir it all up and then leave it to cook down by itself. I did stir it periodically, but if you put it on low, you can set it and forget it. I blended it at the end, and once it cools, it sets up nicely. I poured it into sterilized jars when still hot and then processed the filled jars for 15 minutes. It made three standard sized canning jars, and probably would have made four, but I like to taste test. Thoroughly. Let cool until you hear the jar lids pop. And you’re done! I gave a jar of this to a co-worker as a house-warming gift. Two days later she confessed that it was gone, as she ate it by the spoonful. I was flattered! And now I know what to make for hostess gifts this season! Speaking of which, I’ve seen variations of this recipe lately, with pumpkin mixed in, as it seems the latest seasonal trend on foodie blogs is pumpkin everything. Just a month ago it was apple everything. I’m curious what ubiquitous ingredient the holiday season will bring! If you have a crystal ball and know of which I speak, let me know in the comments! Next Post: Memories of Meals Past! And what I’m craving. This entry was posted in Preserves on October 31, 2014 by Margaret. Plated, and even better than it looks. 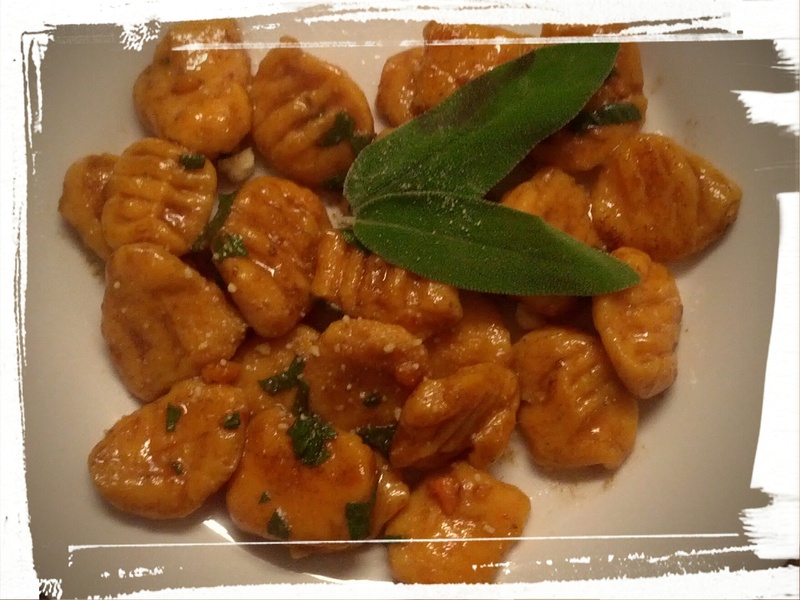 Ok, so I’m lying in bed typing up this post and dreaming of the MOST delicious meal that I made yesterday: Sweet Potato Gnocchi with Brown Butter and Sage. Doesn’t it sound all glamorously foodie-like? Well, it tastes even better! A few years ago I went to Italy and I ate some gnocchi in brown butter, while sitting in a café in a village square in the shadow of the Dolomite mountains, and this dish reminds me of that. Brown butter is the bomb, baby! (Also alliteration. I’m a big fan of alliteration.) 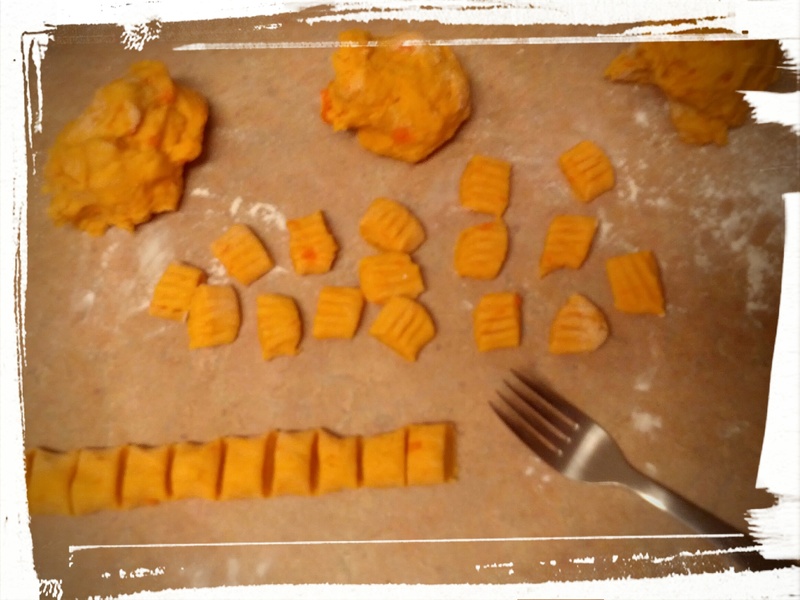 Gnocchi is one of those things that are actually extremely easy to make but look laborious. Anyone remember that rice krispies commercial from years ago, where a mother is making rice krispie squares in a kitchen but it’s so easy that she’s actually relaxing, and then just before she heads out of the kitchen, she splashes some flour on her face and pretends to be exhausted from her labours? No? Just me, then. Well ANYWAY, this recipe is like that. Impressive, tasty, but surprisingly easy. It’s definitely going to be a repeat meal on my menu. Pasta is not my forte, because I can never quite get the pillowy softness to the dough that I’m looking for, but this recipe come close. And one day, I WILL replicate the best gnocchi I ever ate: sitting in a café on the Isle of Murano in Venice, with more gnocchi than I could ever hope to eat in several meals, made by the mother of the owner of the establishment. That was one of the two best pasta meals I’ve ever had. The other was a lasagna dish made with from-scratch noodles, eaten in a very romantic trattoria in Venice proper. My date didn’t believe me when I said it was orgasmic. His loss. But I digress! Try this (nearly orgasmic) gnocchi yourself, and impress your date! How to form the pasta. Easy, right? Prick the sweet potatoes with a fork and pop into the microwave on a potato setting until done. Or bake in an oven. Whatever works for you. Then slice open and scoop the flesh into a mixer, mushing it up. Mix in an egg. Add in salt and nutmeg, and work in almost all of the flour, until you have a dough. If it’s too dry, add the dash of water until it’s pliable. On a floured surface, quarter the dough, and roll each quarter out into dough snakes, about an inch thick. Then cut off inch pieces, and press each piece with a fork. If you’re freezing the gnocchi, toss with extra flour and pop into a freezer bag. If you’re making the dish right away, cook in boiling water (I did it in two batches) until the gnocchi float to the top. Most recipes say 3-5 minutes, but I tend to cook my fresh pasta longer. Looking rustic and ready to be boiled. While the pasta is cooking, melt the butter (again, I did it in two batches) in a frying pan on high, until the butter melt, bubbles a bit, and turns brown. Don’t let it burn, though. It will be all brown-y and there will be brown flecks. Delicious brown flecks. With a slotted spoon, lift the gnocchi from the boiling water and place in the frying pan. The water from the gnocchi will cause the fat to splatter, so beware of that. Then toss the gnocchi with the butter until coated. There should be enough water clinging to the pasta that it becomes a sort of sauce when tossed together (the floury water combines with the fat to make this indescribably delicious butter sauce). Toss in the chopped fresh sage and toss again. Serve with a sprig of fresh sage and wait for the compliments to roll in. Pro Tip: a swirl of olive oil in the salted water will help prevent the pasta from boiling over. I don’t know why, but there’s some scientific principle behind it. Trust me. Or google it. Whichever. This is not the dish to make if you’re worried about your fat intake (I mean, it IS a butter sauce), but hey, moderation is key, and I’m all for low-fat if I can have this high-fat dish occasionally. Oh my gosh, I want more now! The DH had taken the leftovers last night and packed them for lunch. I wonder if there are any left for a midnight snack? Huh. Off to the kitchen, go I! 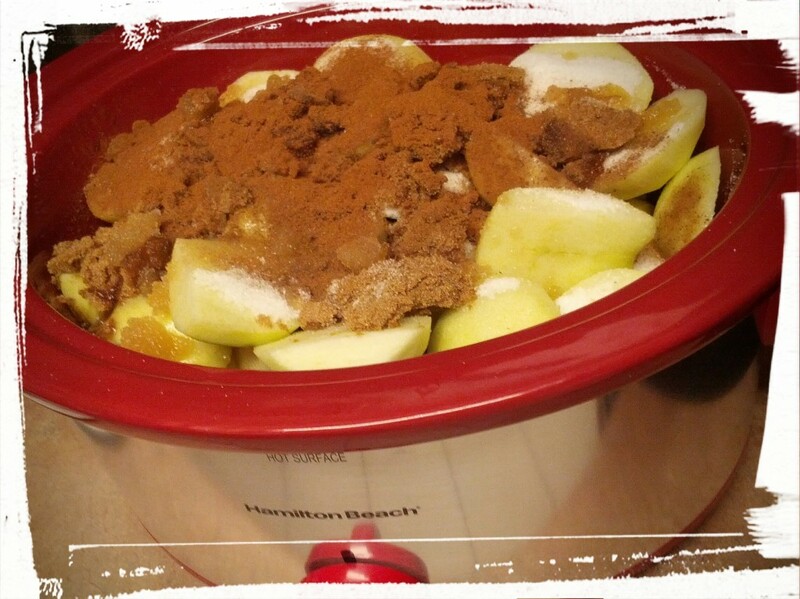 Next Post: Pioneer-Style Slow Cooker Apple Butter. And what I learned about my cooking style. This entry was posted in Vegetarian Main Dishes, Vegetarian Side Dishes on October 28, 2014 by Margaret. Harvest Apple Crumble — Eat it Fast, It Won’t Last Long! All you need is apples…and a couple other items. The DH brought home a grocery bag full of apples the other day. Apparently some Scouts or so had been selling them at his work. 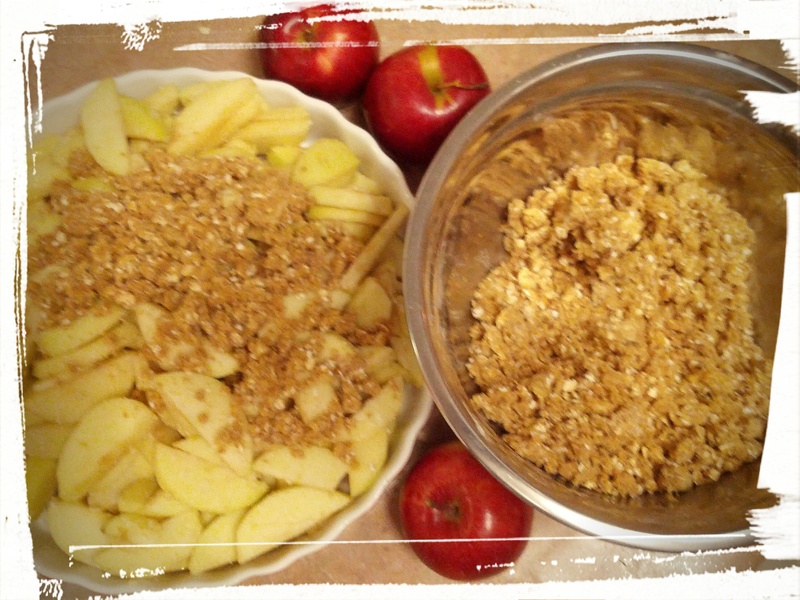 I knew right away what I wanted to make with them: my yummy Harvest Apple Crumble! I had done a test recipe for that when a few friends had come over for dinner a number of weeks prior, but I hadn’t had a chance to document the process, so obviously I had to make another one. For documentation purposes, only. 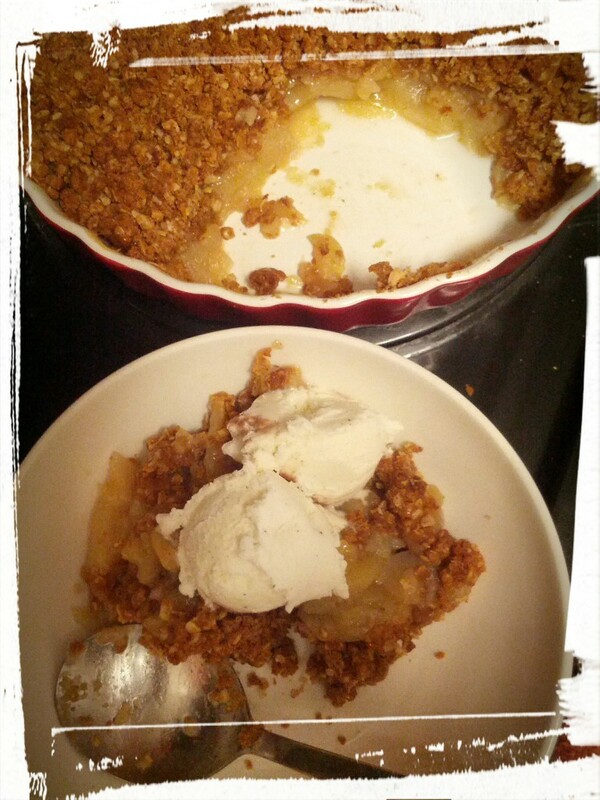 Not that I was craving yummy apple crumble. Uh uh. Ok, so yes, I was craving it! It was soooo good! The first time I made it, the entire dish (a whole flan sized dish) was gone after dessert, and then this time when I made it, the whole thing was gone within 6 hours. Maybe less. And mostly I ate it. Because it’s just soooo good! 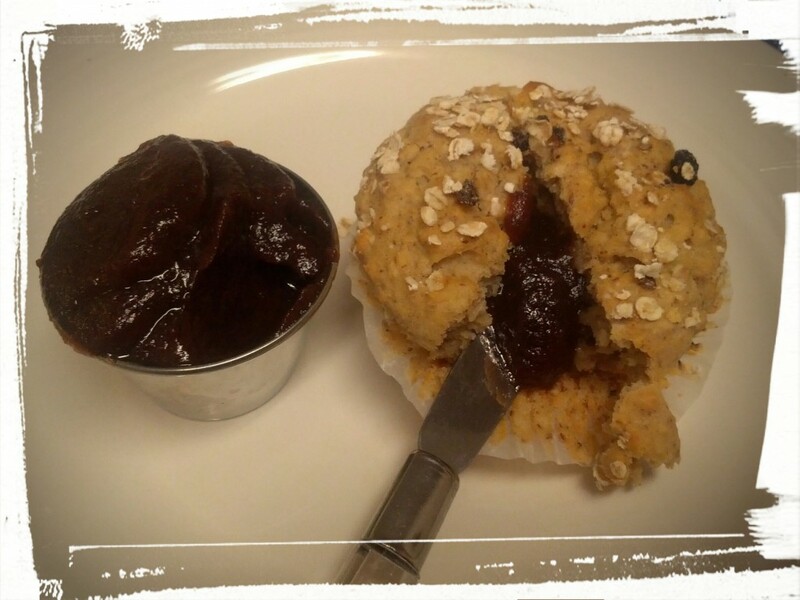 And healthy, too, because there’s a whole cup of oats in it, and only 1/4 c. sugar plus a tbsp. molasses in the entire dish. As with all my recipes, it’s easy, because I don’t like complicated stuff. 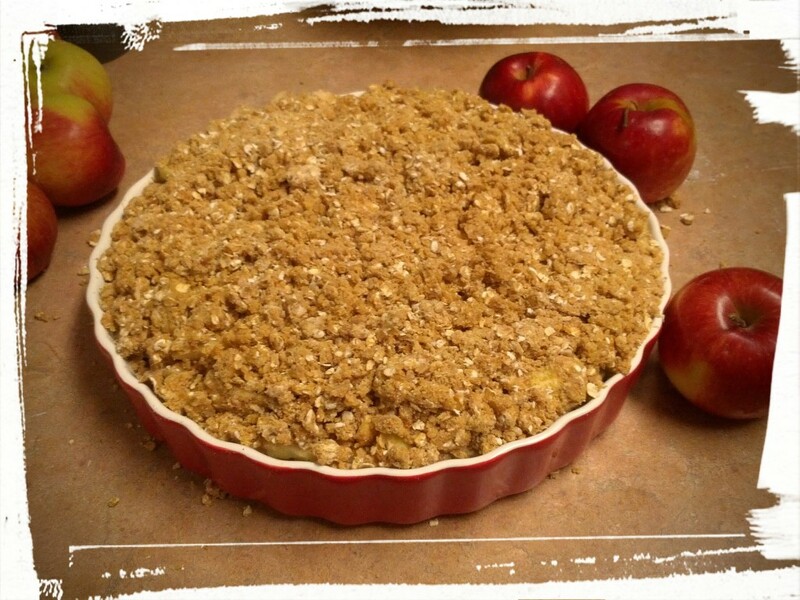 The base is just apples tossed with a tablespoon of flour, and the crumble topping is my Ultimate Caramel Crumb Apple Pie topping, mixed with a cup of oats. Easy peasy! Want some apple-y deliciousness yourself? Peel the apples and slice them. Toss with 1 tbsp. flour. Place in a large flan dish. Mix up the white sugar with the molasses. Dump in everything else and mix until a soft crumb forms. Sprinkle on top of the apples in the dish. Bake in a 350 degree oven until top is golden and apples are soft, about 30 minutes, give or take. And there you are! Isn’t that easy? It’s absolutely scrumptious (said with an uppercrust British accent), especially served with ice cream. At my dinner party, we ate it with amaretti gelato, and oh.my.gosh. I devoured it! If you make it, let me know in the comments how you serve it! Eating it all up because yum! 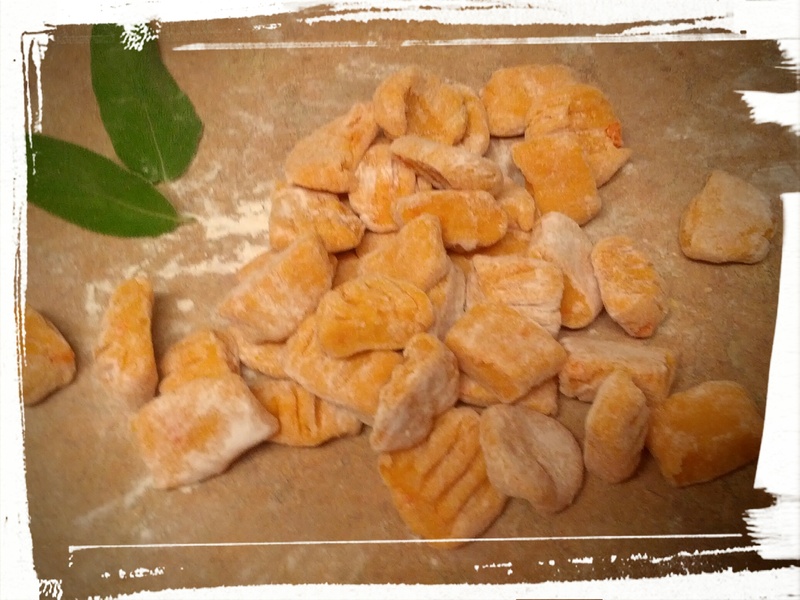 Next Post: Sweet Potato Gnocchi with Brown Butter and Sage. And the friendships you make in the non-profit sector. This entry was posted in Desserts Not Otherwise Categorized on October 27, 2014 by Margaret. 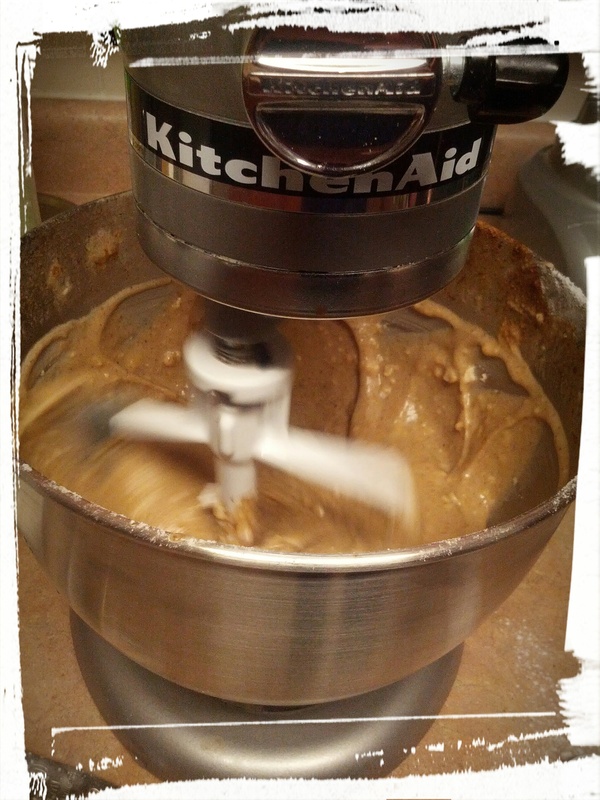 A quick mix of the batter. Don’t overbeat and remember, there WILL be lumps! I made this spice cake for a bake sale recently, and it always conjures up a host of memories for me. When I was a kid, my mom would take my sisters and I for a nice, long walk through a park on Thanksgiving weekend, and she often packed this spice cake for a snack. So for me, I associate it with the fall and with the trees changing colours, with crisp air and hot chocolate. I also associate it with an ex-boyfriend, because I baked it for him once. I had broken my arm in two places (roughly wrist and shoulder) and it had taken months to heal. While it was still in a cast (at least the wrist was. The shoulder was cast-free, and let me tell you, having a broken arm dangling from a broken arm? Is painful), I baked this cake single-handedly. Alright, my sister may have held the bowl for me, so that it didn’t go spinning along the counter top. But I did the rest! Anyway, I packed it up and gave it to him during a winter walk around the neighbourhood, and I still remember the expression on his face as he tasted it. He liked it, of course! And I think you’ll like it too! It’s easy to make, can be fancied up, or just packed as squares for a lunch box. And, it happens to be vegan, so if that’s your thing, you’re in luck! I tend to grease my cake pans with butter, but a mixture of vegetable shortening and flour would make sure the spice cake stayed vegan. This comes from my mum’s recipe box and I’m not entirely sure where she got the recipe from, as it’s from decades ago, so if you know the original source, let me know so that I can credit it. I did change the spice and salt quantities slightly from the original recipe. And now, let’s get our vegan on! Mix together wet ingredients and in a separate bowl, mix together dry ingredients. Then add wet to dry and mix until just moistened (you’ll see some foaming action as the vinegar hits the baking soda). Do not overbeat. There WILL be lumps, and that’s ok! Bake in a 350 degree oven for about 25 minutes or until a knife inserted in the centre comes out clean. A very necessary taste test. Quality control and all that. This will make a single cake layer, which is my favourite pan to bake it in, or a 9′ by 9′ square pan. You can also double it, which is what I did for the bake sale, and bake it in a lasagna pan. 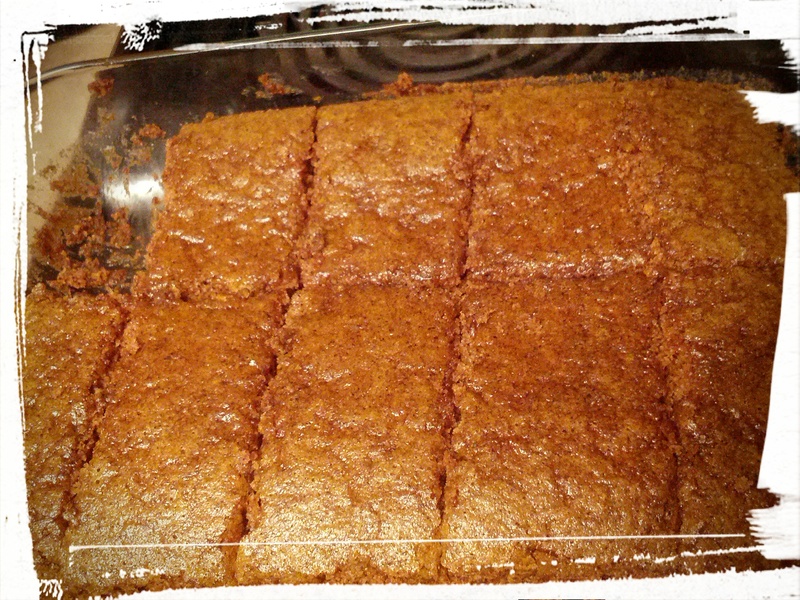 The spice cake freezes nicely, so you can make it ahead and pull it out for lunches as you need it. If you want to fancy it up, you can bake it in a cake pan, and then serve it with a caramel or custard sauce. My mum just sprinkled icing sugar on it in a pretty pattern. If you make it, let me know your favourite way to serve it! 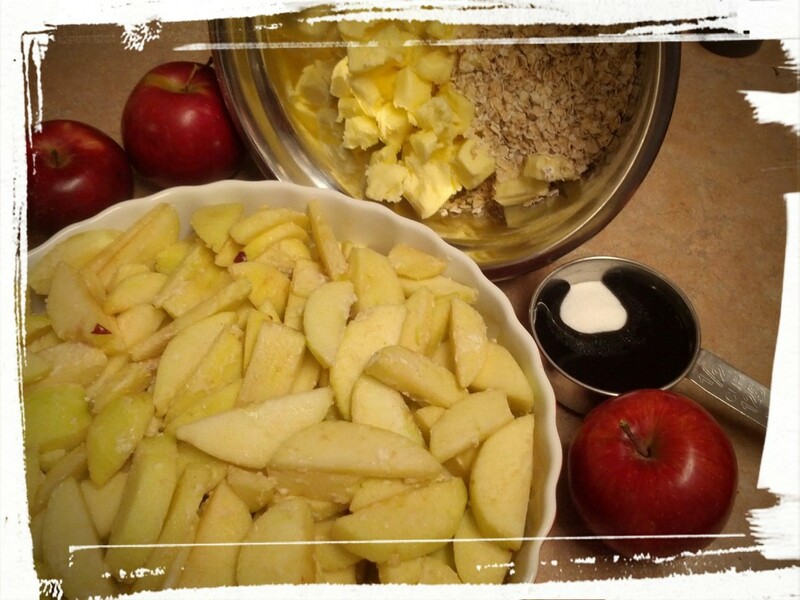 Next Post: Harvest Apple Crumble or Slow Cooker Apple Butter? Any preferences? Both are super easy. This entry was posted in Cakes, Snacks on October 27, 2014 by Margaret.